Department of Homeland Security Secretary Kirstjen Nielsen abruptly stepped down from her role on Sunday, in a long-expected move reportedly fuelled by her clashes with President Donald Trump over immigration and border security policies. Trump announced that Nielsen was leaving the White House earlier today in a tweet, where he also confirmed he had appointed Customs and Border Protection Commissioner Kevin McAleenan as Acting DHS secretary. Although it is currently unconfirmed whether Nielsen decided to leave voluntarily or whether she was forced into resigning, the move comes after a history of disagreements with the president over the handling of illegal immigration and border security. Nielsen said in a separate tweet that she will remain with DHS until April 10. 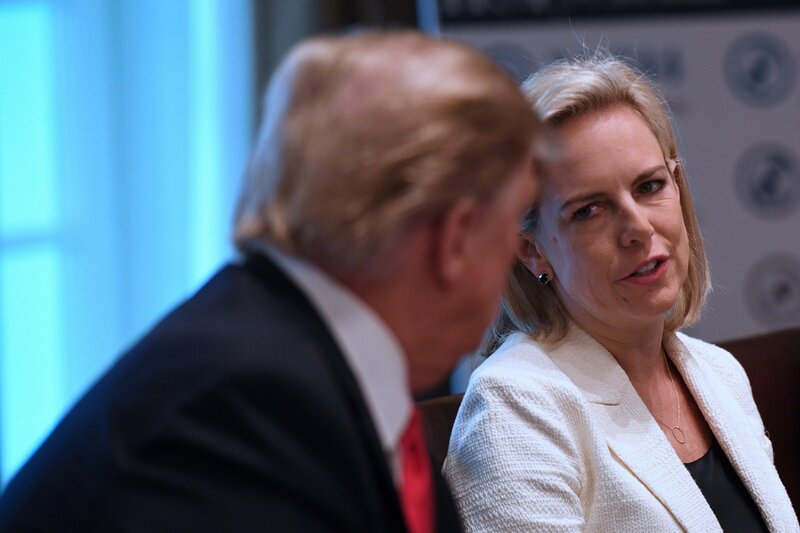 Nielsen, who for over a year was responsible for implementing Trump’s mercurial demands on immigration, often defended the president’s crackdowns on immigration, but that’s never stopped the president from repeatedly criticizing her in Cabinet meetings, and to other Oval Office officials. In light of Nielsen’s departure, here’s a brief look into the former-DHS secretary and Trump’s rocky history during her time in the White House, which began after she was confirmed in December 2017. Immigration officials told the Washington Post last May that Trump berated Nielsen in the Oval Office over concerns about her performance and her failure to minimize illegal border crossings to his standards. According to the officials, when White House chief of staff John Kelly attempted to defend the DHS secretary, Trump pointed out that border numbers were lower under Kelly and demanded to know why she couldn’t keep them down. The uncomfortable meeting came weeks after Trump criticized Nielsen during another Cabinet meeting after he found out that the number of illegal immigrants caught illegally crossing from Mexico exceeded 50,000 for the second month in a row. “Why don’t you have solutions? How is this still happening?” the president reportedly said, according to the Post, “We need to shut it down. We’re closed.” According to the Post, Trump was so furious that White House aides present said others at the meeting were seen grimacing and fidgeting in their seats amid the rant. At the time, the New York Times reported that two of Nielsen’s colleagues said she told them she had drafted a resignation letter but decided against submitting it. DHS spokesperson Tyler Houlton refuted the claims as false. A senior White House official told the Post in May 2018 that Trump always complained to colleagues about how Nielsen was “not tough enough” and reminded them she had been a “George W. Bush person.” Nielsen had previously served in former President George W. Bush’s administration as a Special Assistant to the President, among other roles. But the praise didn’t last. In November, reports began emerging of Trump telling advisers he was considering removing Nielsen from her role and that he wanted her out as soon as possible because of her substandard performance on immigration enforcement.